272 pages | 20 B/W Illus. This book sheds light on the consumption of spiritual products, services, experiences, and places through state-of-the-art studies by leading and emerging scholars in interpretive consumer research, marketing, sociology, anthropology, cultural, and religious studies. The collection brings together fresh views and scholarship on a cultural tension that is at the centre of the lives of countless individuals living in postmodern societies: the relationship between the material and the spiritual, the sacred and the profane. 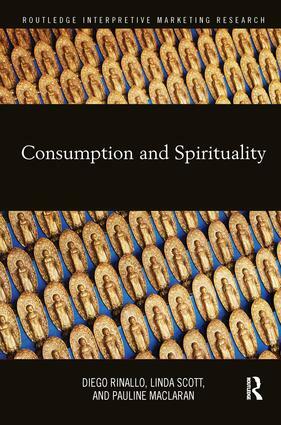 The book examines how a variety of agents – religious institutions, spiritual leaders, marketers and consumers – interact and co-create spiritual meanings in a post-disenchanted society that has been defined as a ‘supermarket of the soul.’ Consumption and Spirituality examines not only religious organizations, but also brands and marketers and the way they infuse their products, services and experiences with spiritual meanings that flow freely in the circuit of culture and can be appropriated by consumers even without purchase acts. From a consumer perspective, the book investigates how spiritual beliefs, practices, and experiences are now embedded into a global consumer culture. Rather than condemning consumption, the chapters in this book highlight consumers’ agency and the creative processes through which authentic spiritual meanings are co-created from a variety of sources, local and global, and sacred and profane alike. Diego Rinallo is an Assistant Professor of Marketing at Università Bocconi, Milan. His research interests include consumer culture, fashion, masculinities, and spirituality. His work has been published in international outlets such as the Journal of Marketing, the Journal of Business Research, Industrial Marketing Management, the Journal of Business, and Industrial Marketing. Linda Scott is DP World Chair for Entrepreneurship and Innovation at the University of Oxford.She has written extensively on advertising, consumption, and women’s economic issues. She is editor of the Advertising & Society Review. Her current research interest is women’s empowerment in emerging markets. Pauline Maclaran is Professor of Marketing and Consumer Research at Royal Holloway, University of London. Pauline’s research interests focus on cultural aspects of contemporary consumption. She has co-edited various books and is Co-editor in Chief of Marketing Theory, a journal that promotes alternative and critical perspectives in marketing and consumer behaviour.